Can you think of the last truly productive meeting you’ve either led or attended? Chances are a meeting will pop up in your schedule this week, and more likely than not, your time could have been better spent. The issue isn’t the meeting itself—there’s nothing wrong with collaboration; rather, it’s the execution. We’re stuck in a rut of tradition, and the thought of change is daunting. Earlier this year, a few of us at PR 20/20 read Al Pittampalli’s (@Pittampalli) book, Read This Before Our Next Meeting, and have since revised the way we manage meetings here at our office. Pittampalli offers a Modern Meeting Standard, which has helped us to maximize our time, both apart and together, by thinking through these crucial elements before calling a meeting. After putting Pittampalli's ideas into practice, and as copywriters at heart, we find that focusing on the 5 Ws (Who, What, When, Where and Why) aids in our effort to streamline collaboration. Office workers spend an average of four hours per week in meetings, and they regard the majority of that time as wasted. Instead of inviting your whole department and their mothers, ignore the formalities of the traditional meeting, and dig down into whose input is critical to the decision. Pittampalli says, “We can’t worry about hurting people’s feelings anymore” at the expense of our own time. Leaders: Make sure every person’s attendance is purposeful, and instrumental in moving the project-at-hand forward. Attendees: If you’re on the other end of an invitation and don’t feel that your presence is truly necessary, speak up. Begin each meeting with a mission statement. 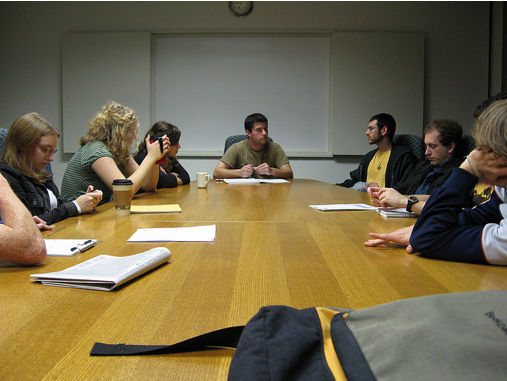 Tell your group what the decision is at hand, and what you want to take away from the meeting. In traditional meetings, we tend to waste so much time catching people up on information they should already know if their presence is required. Leaders: Send any pertinent pre-meeting materials beforehand to those invited. Attendees: Commit to coming prepared. If you can’t, don’t attend. “Too many meetings” was cited as the number one time-waster at the office, according to a recent study by Salary.com. Streamline your meetings’ frequency by asking yourself, “Can this be done by phone or email just as effectively?” If so, do it. Also, avoid calling sudden ad hoc meetings, as they can interrupt productivity. Leaders and Attendees: Incorporate productivity blocks into your daily schedule to temporarily “unplug” and buckle down on large projects and detailed tasks. Designate only those non-production hours to either schedule or accept meetings; you’ll likely increase focus and efficiency as an added bonus. Location may seem like it could be an afterthought, but the environment goes hand-in-hand with the type of gathering you plan to hold. Pittampalli says that when you have multiple people centered around a “tool” (a laptop, whiteboard, etc. ), it’s not a meeting — it’s a either a group work session or a brainstorm. That said, consider what you want to get out of the meeting, and how environment may play a part (i.e. a conference room offers ample space for voices to be heard, but may be too cold or proper for a one-on-one client meeting). Leaders: Don’t confuse a meeting with collaboration. Location will help convey the level of formality and structure, and what is expected of your attendees. Attendees: If you’re working remotely, make use of mobile collaboration tools—such as Google Hangout, GoToMeeting, Yammer, Skype and Facetime—to stay connected. I’ve personally used these tools without a hitch while telecommuting from Colorado to join morning huddles, account team meetings, client presentations, and even the occasional Friday Happy Hour. There are infinite reasons as to why we hold meetings. But, when you boil it down, the sole purpose of any meeting is to coordinate action. Whether your goal is to give wings to a seemingly flightless idea or fine-tune your fiscal year budget, it takes a team with designated roles and clear responsibilities. Leaders: Leave nothing ambiguous. Define associated tasks, delegate them, and assign completion dates. Attendees: Exit from your next meeting with a specific duty to assist the action plan. In any business or industry, processes change throughout the years. So, why not adapt the meeting? Be open to adjusting traditional concepts, even if it takes some getting used to. Share Pittampalli’s recommendations with your co-workers to modernize the way you hold meetings. Once you address an antiquated process, challenges in other areas are sure to stand out, paving the way for true business transformation. Do you use any of these tactics to streamline your business meetings? Share your experiences!